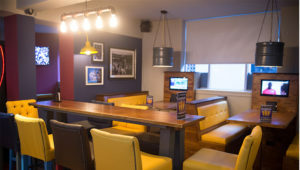 The Independent music bar & grill currently trades as a sports bar and grill and is a prominent and well-known venue situated in the main shopping area of Newcastle-Under-Lyme. Recently refurbished to an impressive standard, this semi-detached building is amongst plenty of pubs and bars, ideally situated on the evening drinking circuit. The pub trades over three levels. 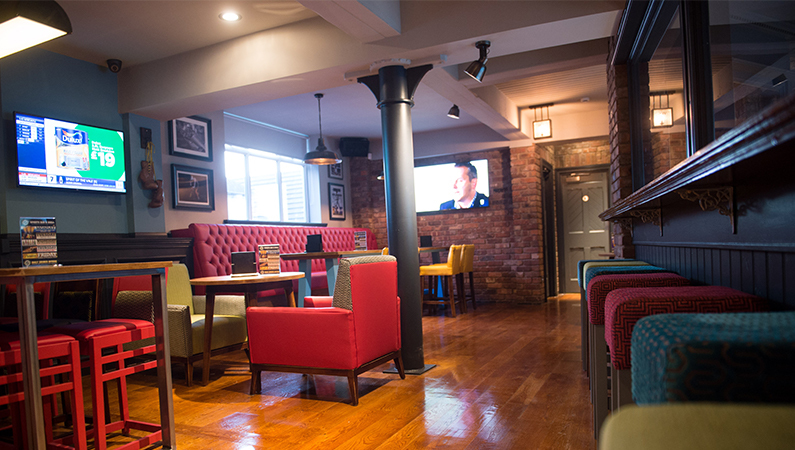 The spacious ground floor area is serviced by one large bar and benefits from booth seating, some of which are fitted with individual TVs. The 2nd floor is a mezzanine level which is within close proximity to the bar on the 3rd floor. 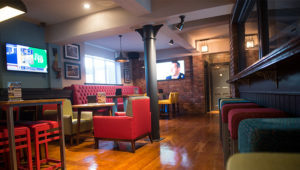 This bar has draught products but also lends itself well as a specialist gin and cocktails bar. 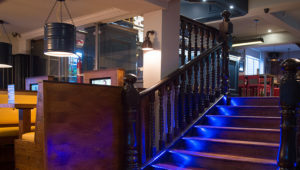 The fully fitted kitchen is situated on the 3rd floor, ideal for serving diners on the top and mezzanine floors, the ground floor is serviced by dumb waiters. 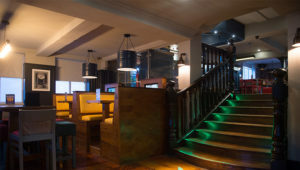 The pub is decorated in a bright modern style and to an excellent standard. The fixtures and fittings are also of an excellent quality. This outlet has very recently undergone a huge refurbishment. It is currently the go-to venue for sports fans offering live sports on more than 20 TVs, including a huge 18ft x 10ft HD screen, an excellent range of drinks and a delicious value for money American grill style menu. As well as sports enthusiasts the pub caters for all passing trade including; families, shoppers and late night drinkers. Due to it’s town centre location there is potential to change the style of operation. The ingoing licensee may wish to maximise trade by targeting a different segment of the demographic, for example by developing an offer that will appeal to daytime visitors as well as targeting late night customers. It may be that you have a totally different vision for this property, we will welcome discussions about any ideas and will work with you to achieve your business aspirations. The private accommodation is large and consists of four bedrooms, bathroom with shower, kitchen and office, all of which are in good condition.  Fixtures and Fittings: Upon Valuation – Funding options available for the right licensee. Tie: All drinks categories are tied.  For fully funded licensees on long term agreements, we offer free-of-tie options for certain drinks categories in exchange for an annual fee. For a breakdown on financial information, please refer to the ‘Additional Info’ tab. 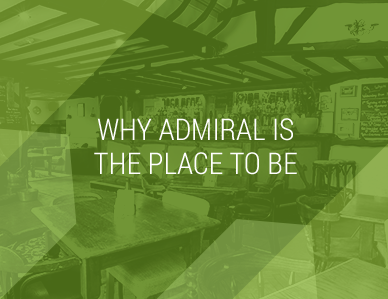 The new licensee may wish to re-position the business and come away from the current sports bar feel. The premises would lend itself well as a late night venue or could be developed into a more food focused business. Given Newcastle’s large student population there is opportunity to develop links with Keele University which will need to be explored and brought to fruition by the ingoing licensee. Training – This is required when taking on a Business Support Agreement. Included is an e-learning package for you and your staff and attendance to our ‘Set Up To Succeed’ workshop held at our Head Office in Chester. Please note, you will be required to attend this workshop before signing a long term tenancy agreement.